Coopers Alehouse | Beer Blotter: Seattle based. World focused. 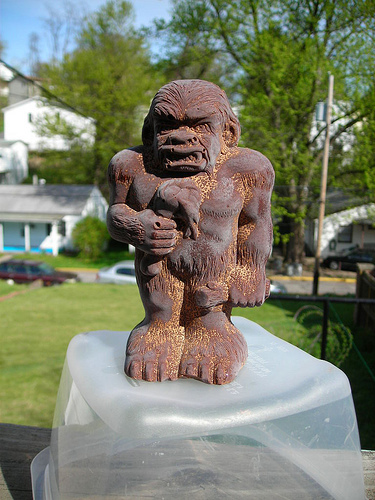 No, not this Chocolate Yeti - check out Great Divide's 2010 Chocolate Yeti Release this week! Hope its sunny where you are and that you are drinking good beers this week. Where can you enjoy a brew this week? Well check it! Speakeasy Brewing Co., located in San Francisco will features the following beers on tap: Big Daddy (single IPA); Double Daddy (Double IPA- hop monster), Prohibition and Scarface Stout. Ok, a free tasting of this killer brewery, Nogne-O– cancel all and any plans you might have tonight to join brewer, Scott Larrick for some samples. Tiger, a Tripel just arrived and will be featured along with the Mikkeller collaboration brew, IPA, Winter Ale, Pumpernickel Porter (just arrived) and their barleywine, among many more. Ballast Point Brewing Co. from San Diego is the main attraction tonight. Order a Ballast Point flight of tasters or a pint and keep the glass, also try the brewery’s very own gin, “Old Groove.” The Draft Lineup looks a little like this: Ginger Big Eye, Yellowtail Pale, Victory at Sea Coffee Vanilla Porter, among several others. You basically get to try an array of style and see where the brewery’s strong points are. Enjoy! First, let me rave about the wings at this establishment- so good. With a variety of sauces, chipotle maple, hot buffalo, garlic…you cant go wrong. What better way to complement your wings than with an IPA? I know, exactly my point. Over 50 IPAs will be poured during the fest which runs for the entire month of April. The first week featured only Washington state brewers, so they are onto nationwide breweries. Call ahead if you are looking for something specific. Both of these beers are scheduled to appear on shelves for all consumers to enjoy TODAY. So kick off the celebration and fork over $15.00 to enjoy three drink tickets and food pairings. Here are the details: great space, $30 ticket will get you 8 6oz pours, 2 food tickets and a commemorative glass. This festival will feature a mix of cask conditioned beers from Oregon breweries. Tickets to the event are available in advance and can be purchased in person at the Green Dragon Bistro & Brewpub; or by phone at (503) 517-0660. Tickets for both sessions are also available online at http://rogue.com/store/. Go to Beveridge Place Pub to try out there IPApril, which features a plethora of IPAs on tap all month. If that doesn’t tickle your fancy – throw something on the BBQ and crack open some special beers. If you know of something to do on Sunday or any other day for that matter, please leave a comment or email us at beerblotter@gmail.com! Cheers!